Planning your caching around the picnic? Coming in from out of town, and want to make sure you don’t miss some of the best caches? Over the next few weeks, we’ll be generating several lists to help with this. 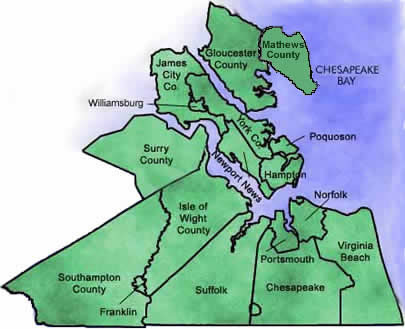 Each list will detail the best geocaches in each city in the Hampton Roads and surrounding areas based on the number of favorite points these caches have earned. 1. Indiana Jones Series – 4 individual caches located in Newport News Park (various parts of the park). GC Codes are GC37QBC (Temple of Doom), GC34RA8 (Raiders of the Lost Ark), GC3GM5W (Kingdon of the Lost Skull) and GC3A5X2 (Last Crusade). Raiders of the Lost Ark and Temple of Doom can easily be completed in less than 2 hours each. I understand that Lost Skull and Last Crusade will take you longer. The total favorite points for these four caches is 89. 2. Christmas Lights Series #1 – 25 – hidden by Chip’n’Lori – located in Newport News – GC41YYY is #1. A cute little series that are mostly park n grabs and can be completed in one day. 41 total favorite points for the series. Distance from Newport News Park = 1 mile to closest cache in the series. 3. GCHR Battleship Series – This series was put together by several local cachers and is the board game converted to a geocaching series. The caches are spread all over the GCHR area but it cannot be completed in one or two days. See GC3DX0F. Distance from Newport News Park = 4 miles to closest cache in the series. 4. Tom Hanks Series – Four very well put together caches, all on the peninsula and the closest is about 4 miles from the park. See GC2NETC, GC2NEV0, GC2NPQV or GC2NQZ3. Total favorite points for these four caches is 82. These can easily be completed in a couple of hours. 5. Captain John Smith Series – there are several CJS caches in the area although the entire series is spread out over Maryland, Virginia and Delaware. See GC2F409. Distance from Newport News Park = 5 miles to closest cache in series. 6. Relections Series – a 7 cache series that is meant to be a night caching series but can be accomplished during the day. This series is located in Gloucester County so there is a small toll to get over the bridge. Distance from Newport News Park = 7 miles to closest cache in the series. 7. Benchmark Series – two very well put together caches dealing with Benchmarks. See GC42ZM8 and GC4567K. Distance from Newport News Park = 9 miles to closest cache in the series. 8. D/T Grid Series – this series has one cache in each Terrain/Difficulty Level and is spread all over the southern Hampton Roads area. This series cannot be completed in one or two days. Distance from Newport News Park = 10 miles to closest cache in the series. 9. VSP Series – There are numerous Virginia State Park caches located around the area. See GC46QE8. Distance from Newport News Park = 10 miles to closest cache in the series. 10. ECUSA Welcomes You series. A nice little series of 10 caches each at a different Episcopal Church in the area. These caches are spread throughout all the Hampton Roads Cities. I believe this cache could be completed in one day. See GCV22G. Distance from Newport News Park = 11 miles to closest cache in the series. 11. You See UMC Series – All located in Isle of Wight County, this series takes you to numerous United Methodist Churches around the county. See GC2XVG8. Distance from Newport News Park = 13 miles to closest cache in the series. 12. Get A Clue Series – a “Clue” type geocaching series spread throughout the southern Hampton Roads area. See GC3EWX3. I do not believe this series can be completed in one day. Distance from Newport News Park = 23 miles to closest cache in the series. 13. The Amazing Geo-Race (First Leg) GC34QA0 – just like the TV show – located in Chesapeake. Not really sure it can be completed in one day. Distance from Newport News Park = 32 miles to closest cache in the series. 14. The Greek Olympians – a series of puzzle caches that aren’t too hard to complete. All are located in Virginia Beach. Distance from Newport News Park = 32 miles to closest cache in the series. 15. Superbowl Series – 7 different caches located in Virginia Beach and Chesapeake dedicated to the Superbowls that the Steelers played in. See GC3WFMF. This series can easily be completed in one day. Distance from Newport News Park = 32 miles to closest cache in the series. 16. The Enneagram - a series of 10 Caches all located in Virginia Beach. Can easily be completed in one day. See GC2CZKJ. Distance from Newport News Park = 33 miles to closest cache in the series. 17. Battlefield Series – a series of 10 caches long Battlefield Blvd in Chesapeake. This series can easily be completed in a couple of hours. Distance from Newport News Park = 33 miles to closest cache in series. 18. Presents for Daddy Series – a great series for kids. 6 puzzle caches, all in Virginia Beach. The puzzles are very easy and the caches are fun. See GC431M4. Distance from Newport News Park = 34 miles to closest cache in the series. 19. ROCK BAND Series. There are quite a few nicknames (some humorous, some not) for this series in Virginia Beach. I recommend using a bike to complete this series (DO NOT WALK IT!). See GC3FRH9. Distance from Newport News Park = 37 miles to closest cache in the series. Note: If you see a series I have missed or one that you want added please contact me. 1 Day, 6 hours, 1 find - what a great cache!!!! I have a secret to tell you!